I'm choosing E3D v6 bowden clone. They are several on the market and I know that the quality will differ a lot. I will print primarily PLA, but I want option to print PC, nylon for future (but its not neccesary!). E3D clone on aliexpress from company XCR3D looks good. This company has positive reviews on their goods and the clone should be able to reach above 300c. Has someone experience with it? Or do you can recommend different clone? Thanks . Must be good according to the description, it will even fly due to the highly optimized thermocouple processed by oxydation on upscale CNC Germany stainless pipe on top of aircraft aluminum ! Edited 1 time(s). Last edit at 05/05/2018 08:25AM by Shank man. I believe this is an updated Hexagon hot-end design, not a v6 clone. "aviation aluminum" is marketing BS. It looks interesting- the heat break fits into the heatsink with set screws instead of being threaded. That looks like a good idea because it should prevent it from coming apart during printing (assuming the set screws stay in place). I've have V6's come unscrewed during printing because there is no way to ensure that the heat break stays screwed into heatsink. You can't tighten it much because you'll twist the skinny little neck of the heatbreak right off. I think using set screws to hold the heater cartridge and thermistor in the block is less than ideal- they may get gunked up with plastic that will make it impossible to replace/reuse thermistors or heater cartridges. The black anodization goes inside the holes for the heater cartridge and thermistor cartridge. Hmmm. The thermistor cartridge appears to have heatshrink tubing over the leads right where they come out of the heater block. I don't know of any heatshrink tubing that will withstand the sort of temperatures that a heater block get to. I like the 50W heater. Edited 1 time(s). Last edit at 05/05/2018 10:34AM by the_digital_dentist. Set screws to clamp the heater cartridge and the heatbrake is a bad idea. The contact area between heater block / cartridge and heatsink / heatbrake is very low. I suppose it depends on the clearances. It would be better if the heatsink (and the heater block) were split so the screws would clamp the bulk of the material around the inserted parts. Edited 1 time(s). Last edit at 05/05/2018 12:18PM by the_digital_dentist. What you have to look in these cheap copies is how and if they can be made to perform. Forget about the false claims, the blatant lies expressed in awful (any language), they have to be considered as unfinished products, almost raw material. For ex: the grub screws are cheap and a bad idea, they will seize, crush and provide poor contact. If there is enough material, a hacksaw, a drill, a tap "et voila". Too bad some heater cartridge holes are drilled to 6.35 (1/4) while the cartridge is 6 ! Now, the real issues are hidden, what about the inside, is it the right diam for the filament, is the finish smooth, will it leak ? Will "CNC Germany quality provide great " as they claim ? Edited 2 time(s). Last edit at 05/06/2018 02:36AM by MKSA. the heater block burn off! stinks,, had me looking for a electrical meltdown kind of smell, but all was fine. took about 12 hours to go from black to light brown printing pla..
overall cant complain about the metal work looked clean and well made. the thermistor was DOA or something but marlin didnt like it failed PID calibration temp over shot every time and marlins thermal protection kicked in, so it got dumped in the sin bin. the heatshrink tubing obstructs just how far the thermistor slips in, comparing depth from the outside it appears the tip of the thermistor tube reaches the grub screw... like I said though first thing that went into the bin!,,,, anyone thinking of getting this HE should think off grabbing a spare. " I used an bead style in the end . Edited 2 time(s). Last edit at 05/06/2018 03:52AM by jinx. That longer length may be good in my CubeX machine that requires extenders to use v6 hotends. What is the overall length? Edited 3 time(s). Last edit at 05/07/2018 02:58AM by jerryjs8. Sorry but the longer, the worse, certainly for a direct drive, less for a Bowden. On a Delta, any angular error will lead to errors in the XY plane. For said delta, you could raise the hotend mount so the nozzle is as close to flush with the effector in order to avoid that error. Doesn't that just mean you have to mount the extruder and hot end higher up? Here an example. the 30mm fan not shown is attached with a clip made with spring steel. I ordered and received one of the hexagon hot-ends from XCR3D. It seems to be well made- the fan mount is rock solid, the fan is absolutely silent. The heatbreak fits into the heatsink in a tight clearance hole, so I think the set screws that hold it in are fine. Everything seems to be machined well. It fits tightly into my Titan extruder- tighter than the E3D v6 does, which is a +. It seems to be more solidly mounted. We'll see how it holds up over time, but my initial impression is that it's very good, especially for the price. Praise for a Chinese knockoff from TDD? Never thought I'd see the day. Initial impressions are one thing, long term performance is another. AFAIK, the hexagon hot-end was always a Chinese product. Edited 1 time(s). Last edit at 05/23/2018 09:50PM by the_digital_dentist. I don't think it was always a chinese product, I think one of the old reprap based companies started it up and then lulzbot adopted it. I thought the hexagon was a US creation (early developments) then adopted by the EU and the RepRap.me friendly crowd. china mashed it! just wish it was sorter. Edited 1 time(s). Last edit at 05/27/2018 01:29PM by jinx. Who sells a metal Titan? I've been printing with the XCR3D hot-end and it performs very nicely. So far ABS, PLA, and PETG. another ali offering SWmaker producing them i think, but I got one of this seller I swapped out the bowden adapter from a plastic kit thou. My biggest problem with the Titan is that it's plastic and a little too flexible. A metal one might be a big improvement. It looks like they've integrated a solid metal mount for it and that you can take off the front plate, and so remove the hot-end, without unmounting or taking apart the whole extruder. Very nice! Both of those have been my main dislikes of the Titan. Is it well made? Any problems? Edited 2 time(s). Last edit at 05/28/2018 11:15AM by the_digital_dentist. Closer study of the pictures reveals that just like the Titan, the screws that hold the extruder to the motor and mounting plate also hold the cover on (except for the motor screw in the lower right corner). That means you can't really take the cover off without having the motor loosen from it's mount. If I were designing it, I make it so that the cover screws on independent of the motor mounting screws so that the cover can come off without any risk of moving the whole extruder. The metal piece that guides the filament from the drive gear down into the hot-end appears to have a much larger gap than the plastic Titan, so it may be a problem to print with flexible filament, and if filament runs out during a print, it may be necessary to take the extruder apart to get the stub out of the hot-end before you can feed in new filament. I went through that with the BullDog XL. Ugh! 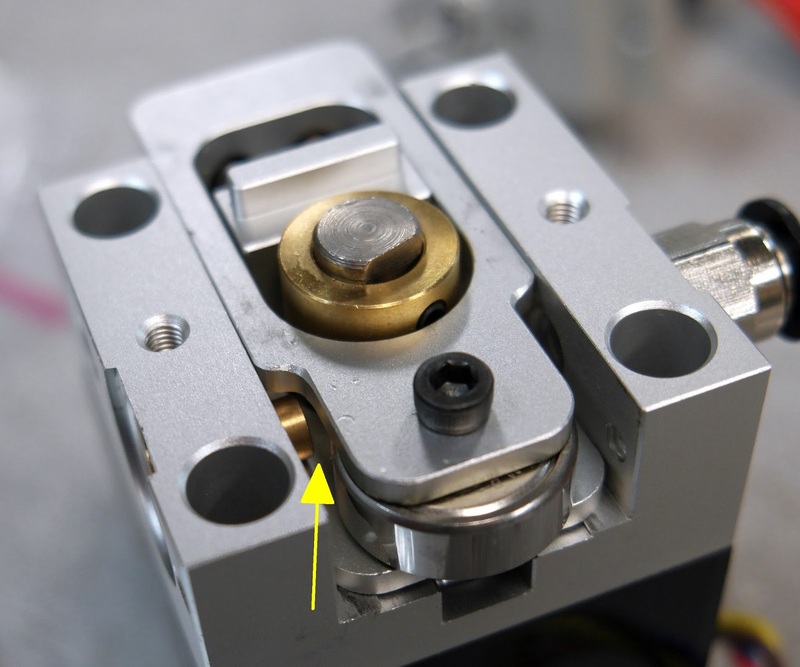 They did put a screw in the cover to clamp the hot-end securely into the body of the extruder. That's good. say there less room in the fila guide ,,, the plastic style has a cone like entry , where the metal more tubular, filament loading/changing been a real smooth transition between the sections. if we had extruder chart this one could top it. in a year! I noticed that at 37 seconds the filament wanders to the left and then back to center. I wonder if that would produce some uneven extrusion that would be visible if it were on an outer perimeter. It looks like the way the filament drive teeth are cut the curvature is too shallow compared to E3D's part. Does the E3D gear/hob fit in that extruder? Can you take a picture of it with filament loaded but the cover off- I'd like to see what the gap is like between to feed tube and the drive gear. Thanks for posting this stuff. such an unfair test to start with,, coming to the end of the spool with thecoil that comes with it. The Hexagon was created by Reprap Discount with some input from members of Hackerspace Frankfurt. Thanks for posting the pix. And thanks for the history lesson. Isn't RepRapDiscount a Chinese company? I got my BullDog XL from them. The wandering filament isn't about loss of traction, it's about feed rate. When the filament rides over to the side instead of the center of the hob, the diameter is larger so the filament will feed slightly faster while it's over there, resulting in temporary over-extrusion. That would show up as a bulge in the print layer if it occurred while printing on the surface of a part. The gap between the drive gear and the filament feed tube is large enough for flexible filament to buckle, then wrap around the drive gear. You're probably not going to be using flexible filament with a Bowden setup anyway, but it definitely makes it harder to use flexible filament for a direct drive setup. I used flexible filament with my otherwise extremely reliable BullDog XL that had a similar sized gap, but it was tricky to get the filament fed into it, and print speed had to be keep down to 20 mm/sec to prevent the filament from buckling. Here's the BullDog XL gap. And here's what happens if you crank the pinch roller pressure so high that it crushes the filament (ABS in this case). This happened at the Makerspace which I have found is the perfect place to test a printer design (and training materials) for flaws of every sort. The final problem with the gap is that if you run out of filament during a print (you can prevent that with a run-out sensor or simply weighing your filament before starting a print) there will be a stub of filament in the hot-end that goes right up to the drive gear, filling the gap between the drive gear and the feed tube. Since the extruder can no longer grab the filament, it can't push it down or back it out. If you try to insert fresh filament, the stub that is bridging the gap will flex instead of going down into the hot-end, and unless you get very lucky (you can't see it because it's happening behind the front cover), will prevent you from inserting the new filament into the feed tube. The plastic Titan doesn't have this problem because the feed tube goes right up to the drive gear. You will then have to take the thing apart so you can grab the filament stub in the hot-end and pull it out. After having that happen to the BullDog about 5 times in 2 weeks at the makerspace, I added a run-out sensor to the printer that stops the printer when there's about 300 mm of filament still sticking out of the extruder. You'd think that would solve the problem- it did, but it created another problem. If you power up the machine without filament in the sensor, the LCD screen comes up blank (Smoothieboard). Shortly after installing the run-out sensor I started getting calls and emails about the machine being broken because the screen was blank when power was switched on! If you're ever developing a 3D printer design and want to see where all its weaknesses are, put the machine in a makerspace and let a bunch of cosplay people try to make props with it! The bulldog is a RepRap Discount creation as well as the RUMBA board (again with contribution from HackFFM). They were also the first to produce the Merlin Hotend. I found the Bulldog XL disapointing, mostly due to the gap you showed so nicely. I still have two or three of them, but haven't used them in years. Another factor is that they are just not nice to use, they are bulky, heavy and require quite a bit of force to load and unload. The XL is the solution for a problem that shouldn't exist, bad hotends that require excessive force to keep going. 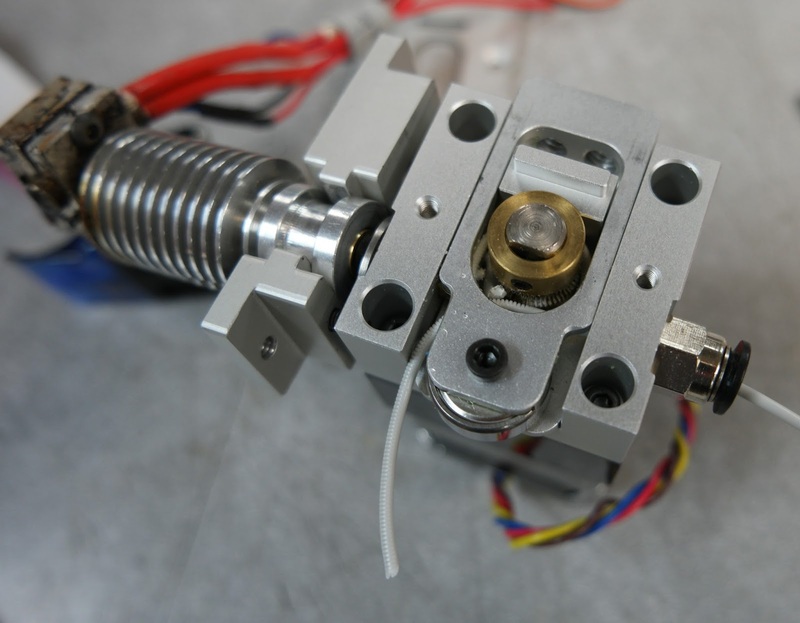 I designed a lightweight direct extruder for my own use that can print even the softest Filament at useful speeds, due to precise filament guidance and a hotend that needs little force,. I think the metal Titan could be modified to eliminate the gap pretty easily- drill a hole to fit a piece of teflon tubing from the top or drill from the bottom and epoxy a piece of brass tubing and trim the end to fit close to the drive gear. I switched from a non-geared extruder to the BullDog XL about 5 years ago and I was suddenly able to print reliably. All that pushing force keeps the plastic flowing even if things get a little less than ideal in the hot-end, and extrusion is very smooth. The BullDog has a drive gear that's about 12 mm diameter and has a 5:1 gearbox. The Titan can probably manage the same pushing force with the 3:1 gearing because the drive gear diameter is only about 6 mm. IRIC, they both used about the same steps/mm settings. The BullDog was capable of really smashing the filament and did take a bit of muscle to release the pinch roller pressure to fed in fresh filament. The worst thing about the BullDog was that if filament ran out during a print you had to take the hot-end off to get the stub out and the thing was assembled with different sized screws that were difficult to reach, especially with a V6 hot end. Edited 1 time(s). Last edit at 05/29/2018 01:10PM by the_digital_dentist.